One of my favourite wines is the ‘Primitivo di Manduria’ produced from 60 year old vines, either the 2006 or the 2007 vintages (I like both) which I usually have at Bacco ristorante and wine bar in Thonglor, which is my favourite Italian restaurant in Bangkok. Manduria is a small country town in the province of Taranto with about 30,000 inhabitants in Apulia, close to the coast of Southern Italy. Apart from its interesting history it is also a place where the best Primitivo grapes are grown and made into wine. The DOC Primitivo di Manduria wines are unlike other Primitivo wines made with a 100% of Primitivo grapes. 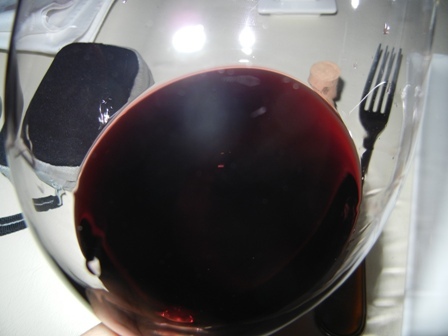 The wines are usually heavy, dark red and have at least 14% of alcohol. More than two thousands years ago the Primitivo grapes were brought from Greece to Southern Italy and ever since wine making was part of the local culture. In the video clip above the vines are not supported by any trellis system. The grapes are harvested by hand without secateurs. The bunches are small. The farm vehicle delivering the grapes to the winery is tiny. Italo Western come to mind when listening to the film music. The processing, however, is more on the modern side. And I love the end of the clip when a glass of Primitivo is presented. 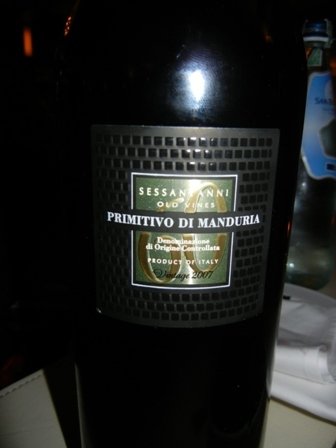 The ‘2007 Primitivo di Manduria Sessantanni Old Wines’ by Feudi di San Marzano, is a great wine. I love the fruitiness, the elegance with the dense and velvety tannins, the finely balanced acids. Hmm, just like being in paradise. Feudi di San Marzano is not a small producer though, it has 500 ha under vines and produces a wide range of wines, many from indigenous varieties. So if you are in Bangkok and you want truly Italian experience, go to Bacco and order a bottle of Primitivo di Manduria. You will not be disappointed. 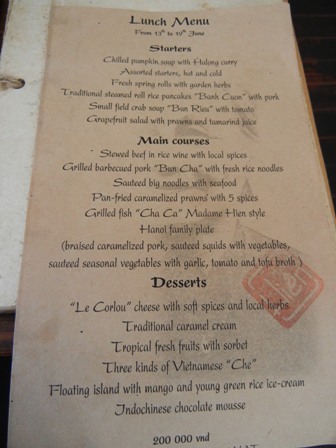 This entry was posted on Saturday, December 3rd, 2011 at 11:46 pm and is filed under wine, wine regions. You can follow any responses to this entry through the RSS 2.0 feed. You can leave a response, or trackback from your own site. I’m experiencing some minor security probpems with my latest website and I’d like to find something more secure.